X2 Budweiser FA cup. Official beer to the Emirates FA cup. Heavy duty thick rubber bar runners. 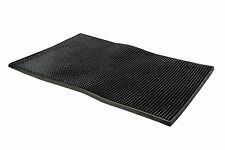 ProChef Large Rubber Mat Bar Counter Runner Drinks Mat 12"x18"
Professional bar runner mat. Professional bar mat. Catering Base. Beer Towels. Bar Towels. Bar Mats. 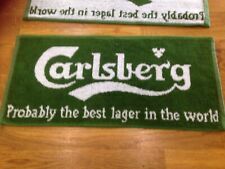 Vintage Carlsberg Lager Bar Towel. Condition is New. Dispatched with Royal Mail 2nd Class. 5 Adnams bar towels, beer towels, beer mats. Brand new in packet. Grolsch Premium Lager 50cm x10cm Long Rubber Bar Rail Mat. Condition is Used but undamaged. CARLING LAGER BAR TOWEL WITH EMBROIDERED LOGO. FOSTER'S LAGER BAR TOWEL. USED BUT IN EXCELLENT CONDITION - PLENTY OF LIFE LEFT IN IT! 2 x new never used Stoli Vodka bar runners / mats great for bars and man caves! Greene King bar runner rubber. Official beer of England Cricket. 2 X Stowford Press Bar Mats . Condition is New. Dispatched with Royal Mail 2nd Class. 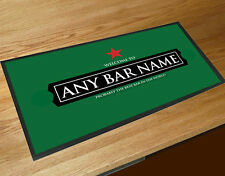 White Personalised Bar Mat. Personalised Cushion Cover & Pillow Case Printed Photo Gift Custom Made Print. Personalised Luggage Strap, Suitcase With Lock Safe Luggage Belt Printed. White Bar Mat - With black rubber backing. The Beer Mats Coasters are made using state-of-the-art printing on high quality beer mat board. Made in London Rubber beer mat. London Pride. St. Austell Brewery Tribute Cornish Pale Ale Rubber Bar Mat / Runner. Condition is New. Dispatched with Royal Mail 2nd Class. Beer Towels. Bar Towels. Bar Mats. Vintage Whitbread Best Bitter Bar Towel. Condition is Used. Dispatched with Royal Mail 2nd Class.